Shri Padmanabhaswamy Temple is an ancient temple that has a history that dates back to 500 BC and is situated in the East Fort situated in Thiruvananthapuram which is the capital of Kerala. The Supreme presiding deity in the temple to whom the temple is dedicated is Lord Vishnu. The temple is composed of a mixture of two styles of architecture, them being Kerala and Dravidian styles. Everything existing today has a history of which can be traced back to. So does this temple which goes back to the 8th century. This temple has been identified as one amongst the other 108 Vishnu Temples or 'Divya Desams' in India. These Divya Desams are considered to be the most sacred and holy places where Lord Vishnu resides. They have also been mentioned in the works of the Tamilian Saints also known as Azhvars. In fact, the name of the capital city of Kerala that is Thiruvananthapuram too has been derived from the supreme deity of Sri Padmanabhaswamy Temple also known as Anantha who is the one reclining on Anathana serpent. Therefore, Thiruvananthapuram means the land of Sri Anantha Padmanabhaswamy. The main topic of interest at this temple is the talk about its vaults and what makes the temple the richest temple in the world! 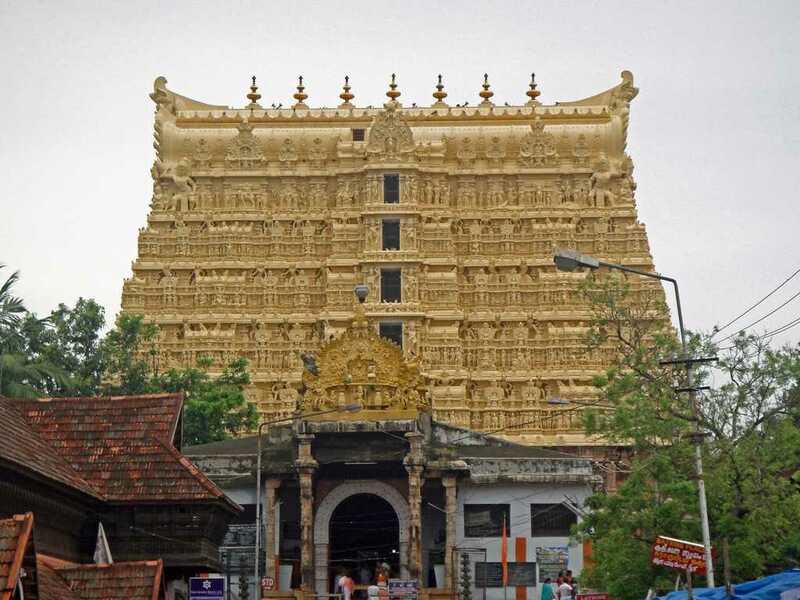 It is said that the Padmanabhaswamy Temple treasure vaults holds fortunes enough to save the world from its various issues but the treasures are bound by an ancient curse. Lets get into this mystery, shall we? The temple has long been in talks for its tales related to hidden treasures and is unlike the other temples of Kerala is controlled by the royal family of Travancore. The Supreme Court made a committee consisting of five members in-charge of the administration of the temple. Vinod Rai who was a comptroller and auditor previously was made to audit temple properties, assets, and accounts. The court also withheld opening vault B until and unless all the other vaults were finished. It was only in July 2011 that the general public came to know about the hidden treasure in the vaults and that the Padmanabhaswamy Temple treasure was worth Rs. 100000 crore after the first report regarding the same was submitted by Vinod Rai. Apparently, the treasure was hidden five feet beneath the ground. Although it was being said that vault B had not been opened, it was reported by Rai that according to the temple records, the vault had been opened two times in 1990 and then five times in 2002. This mystery about the opening of vault B is therefore still doing the rounds. What Are In The Padmanabhaswamy Temple Vaults? 1. Gold coins which can be traced back to thousands of years, including 7 kg of gold coins which could be traced back to the 1700s, 18 coins from the era of Napolean's rule, valuable stones wrapped in bundles of silk in addition to 1000 kg of gold in the form of coins as well as trinkets. 2. Jewellery including a 9 foot long gold necklace weighing 2.5 kg, 1 ton of rice gems made with gold, gold sticks, diamond sacks, gold ropes, multiple pieces of antique jewelry adorned with diamonds and emerald and many other ornaments in chamber A. All this jewellery were kept in ancient baskets, earthen pots, copper pots and more. 3. A small golden statue of an elephant. There were some sovereigns with the 1772 seal meaning that they belonged to the time of King Karthika Thirunal Rama Varma. However, as of now the existence of another inner chamber which is hidden under Vault B has not been taken into account. This chamber is quite ancient and is believed to be made up of thick walls of gold. This is exactly where the mystery continues since the royal family of Travancore is not permitting officials to open the vault as they believe it may anger the Gods and befall a terrible curse upon the nation. Vault B is so heavily protected that there are two antechambers that lead to the main vault. The carvings of a serpent and a Yakshi on the door of the vault were done as a warning to keep out. It is said that Vault B was sealed to protect the Padmanabhaswamy Temple treasure with the Naga Paasam mantras chanted by the highest religious heads during the time of King Marthanda Varma. And the curse can only be lifted only with the help of one of the highest priests. 1. An occurrence in the 1930s raised a lot of questions about the curse being the Padmanabhaswamy Temple treasure. It is said that miscreants were trying to break into vault B and were attacked by a hoard of snakes that appeared out of nowhere. 2. The petitioner of the vaults, Sundarajan, had an untimely death one month after the vaults were opened. 3. Another person associated with the opening of the vaults faced the loss of his mother. This strengthened the belief of the royal family and everyone else on the curse that holds the vaults. 4. Another interesting story states that the temple priests tried unlocking the door over a hundred years ago so they could use the treasure to save the country from the ongoing famine at the time. But as they got closer, they could hear gushing waves behind the door. Legend has it that it is connected to the Arabian Sea! The temple has sure made headlines and has been an incredible event in the history of the country as well as for the ones who discovered it dug deep inside. One should surely pay a visit to the temple whenever a trip anywhere nearby is planned.